Rising superstar painter Felipe Massafera provides this gorgeous depiction of exotic jungle action icons Sheena and Tarzan on this super-rare "Virgin Art" variant edition. 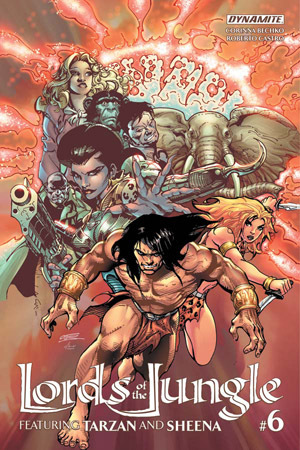 In this issue, Tarzan and Sheena face off against a woman who shouldn't exist, a death-mad cult with access to impossible technology, and the hard fact that neither of them is very good at working as part of a team. With Jane's help they have just one chance to save both their homes and their futures, but will it be enough to save their own skins?